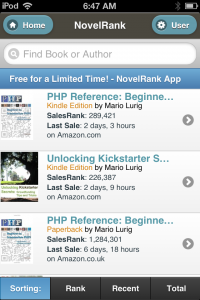 The NovelRank Web App is now available in a free preview for all users. While it is fully functional in a PC’s browser, it is designed for mobile smartphones and tablets. All you need is the username from your user account to get going. As mentioned previously, this is a free preview of the app. Soon it will only be available to users who are part of NovelRank Pro, an upcoming value-add service that provides improvements to NovelRank that give your books priority as well as save you time and effort to get the data you want, all in a single annual fee for your entire user account. Until that is released, the web-app will stay free for everyone to use. Let me know what you think of the app in the comments below! This entry was posted in News and tagged app, mobile, user pages on January 24, 2013 by Mario Lurig.